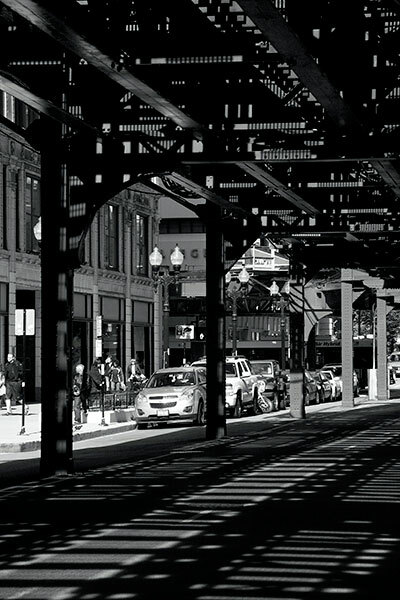 The CHICAGO BUILDINGS & TRAINS gallery sets the downtown EL into an architectural context: the images in this set show some street views from below the tracks. 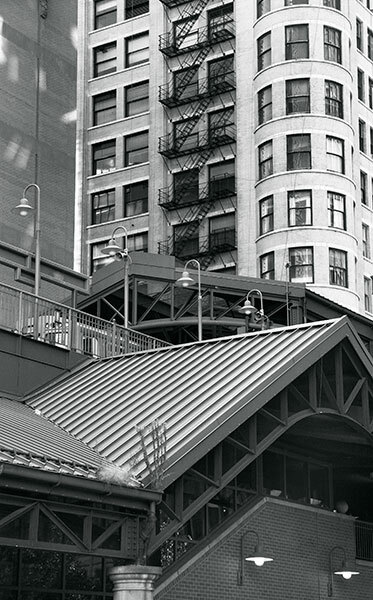 The Library station entrances and superstructure are set on the earlier elevated railroad deck and share some material and design details with the Library building. Both are named after a former Mayor of Chicago. This EL station is rather older and less pristine than its Library counterpart. 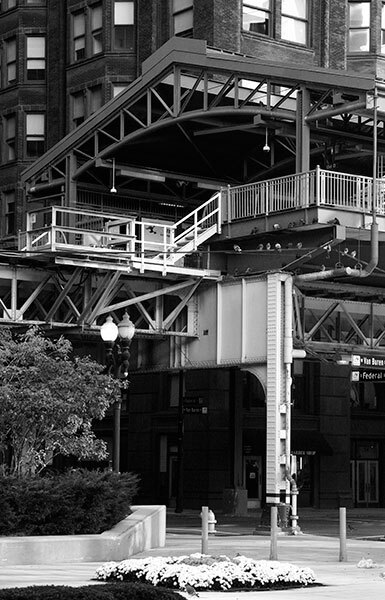 Some of the Avenue stations have been refurbished, the steelwork finished in a maroon red paint similar to that being applied in renovations to the bridges over the Chicago River. In earlier times a black powder was added to the red lead paint to mute its bright tones. A control tower stands on the four-way crossover railway junction at the intersection of Wells and Lake Streets. 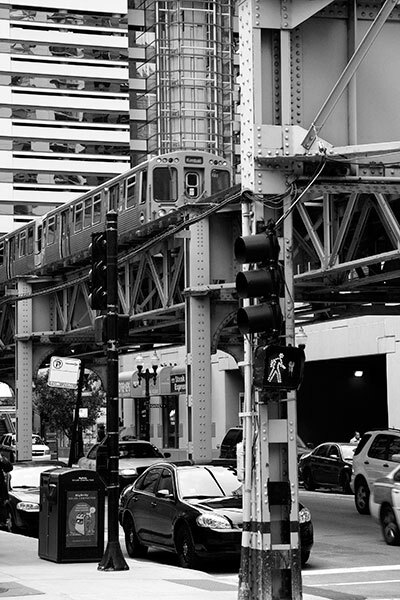 The Brown Line trains head north to Merchandise Mart station after completing a Loop circuit. This disused single span bascule bridge was completed in 1908 to carry the Chicago & North Western railroad tracks across the Chicago River into the city. It once gave access that Railroad's Wells Street station and freight yards. Later, it served commercial buildings before closing in 2000: it was designated a Chicago Landmark in 2007. 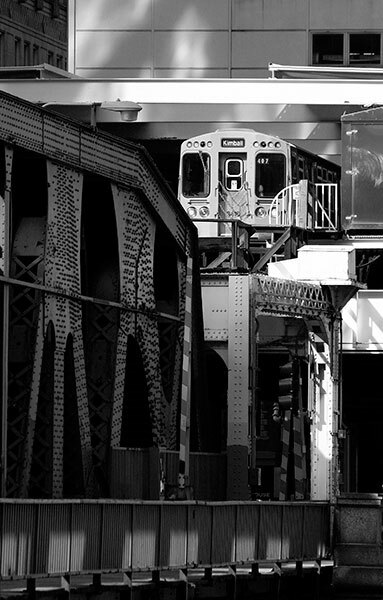 A train heads south over the twin-deck Wells Street Bridge from Merchandise Mart station, the departure and arrival point for a Brown Line “Kimball” train to complete a circuit of The Loop. 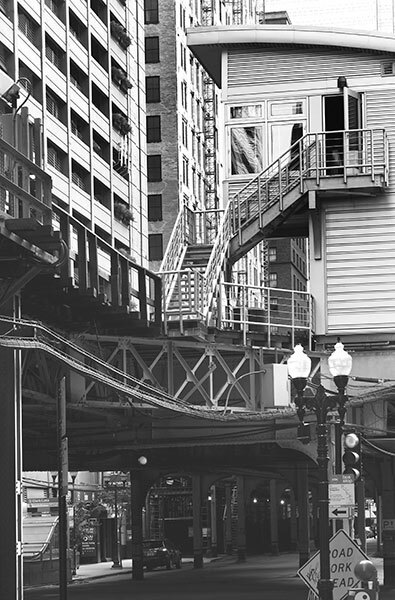 This bridge carries tracks from the Ogilvie Transportation Center occupying the site of the Chicago & North Western Railroad terminal of 1911. The CitiCorp Center building replaced the station's original administrative building in 1987 and a later rebuild of the train station itself occupied four years in the nineties without disruption of train services. Designed by Alfred Alschuler and completed in 1923, The London Guarantee looks across over North Michigan Avenue Bridge. 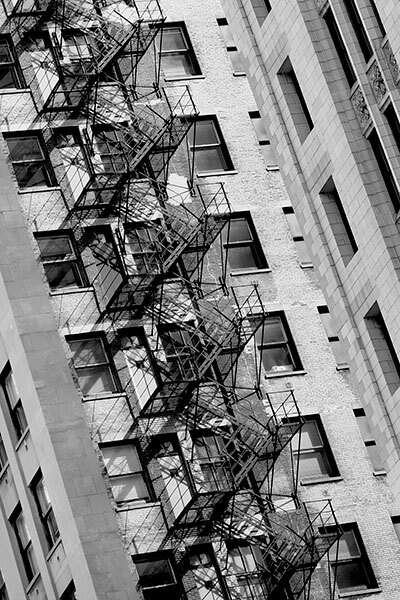 This is a detail of the fire escape that serves some twenty storeys on the West Wacker Drive flank of the building. 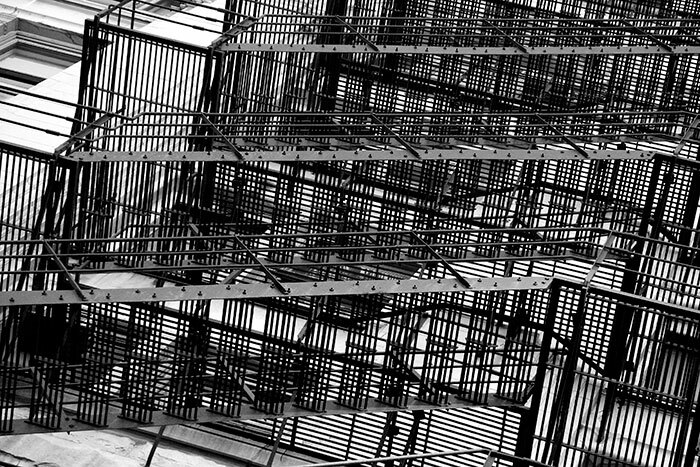 This and the following image were made from a Wabash Avenue car park at the rear of the Plaza Hotel that opens on to Michigan Avenue. The almost white paint was an ideal backing for the shadows cast by the black ironwork. 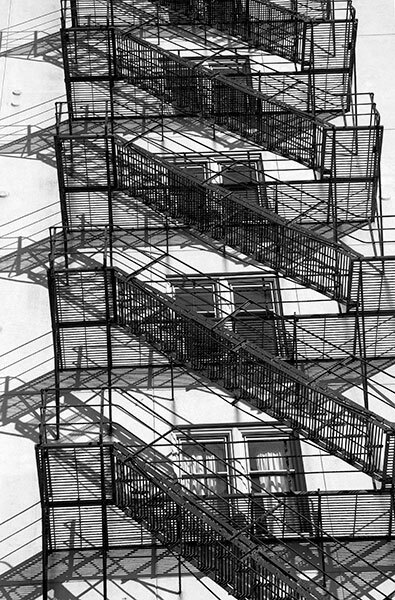 If I lived in Chicago, fire escapes in all their variety of engineering design, size and relationship to their parent building would merit a more extensive exploration than a short visit allows. It must be their geometry and the perspective effect on perception that appeals. This is the rear elevation of the parking garage although the main façade looks much the same. 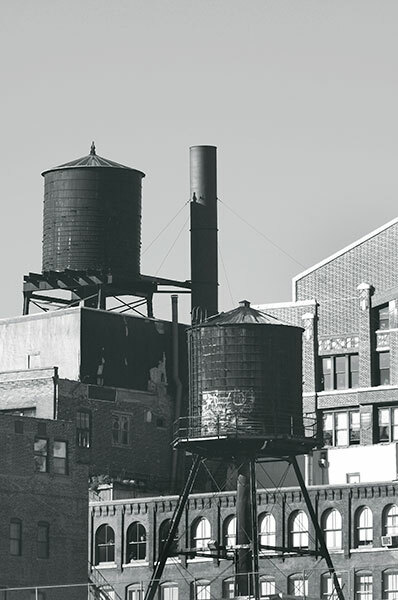 My main interest was its roof-top water tower backed by another on a Dearborn Street Building. 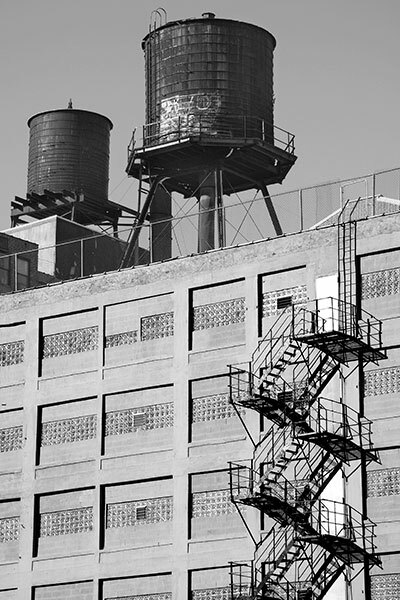 A second view of the same water towers on their respective buildings, the perspective compressed through a long lens. The roof gable at right tops one of several architecturally interesting buildings on Dearborn Street's Printers Row. 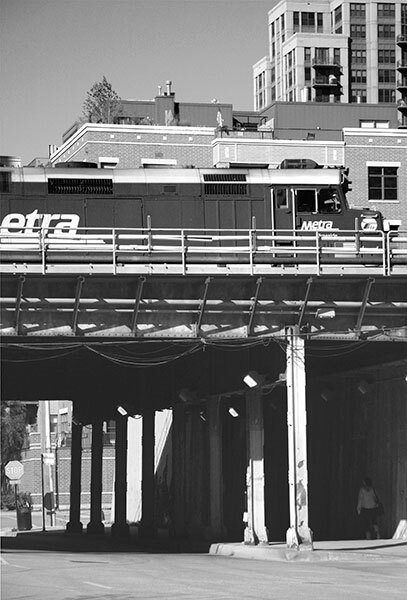 The upper deck carries rail tracks above the road on the Wells Street Bridge. Like the others, this is a bascule bridge that opens to river traffic when required: it was the largest of its kind when opened in 1922. 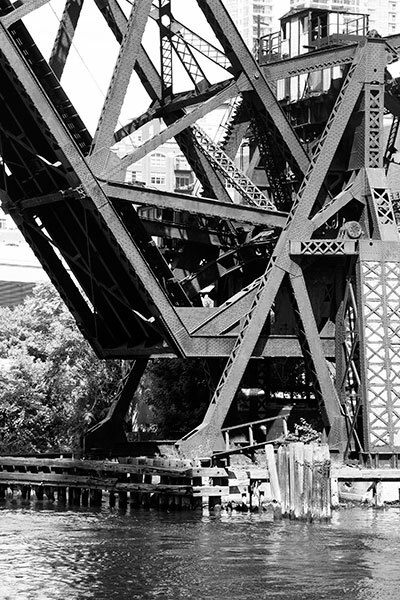 The CHICAGO BRIDGE HOUSES gallery shows images of this and other bridges around The Loop. Its compositions concentrate on the bridge tended houses placed on both banks to house the lift machinery and operating crews. 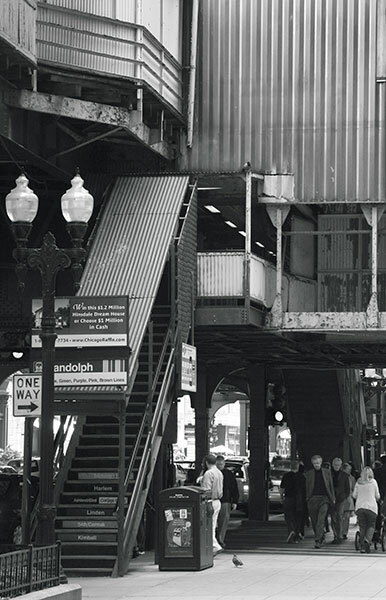 Standing at the crossing of Wells and Madison Streets looking south under the EL steelwork. 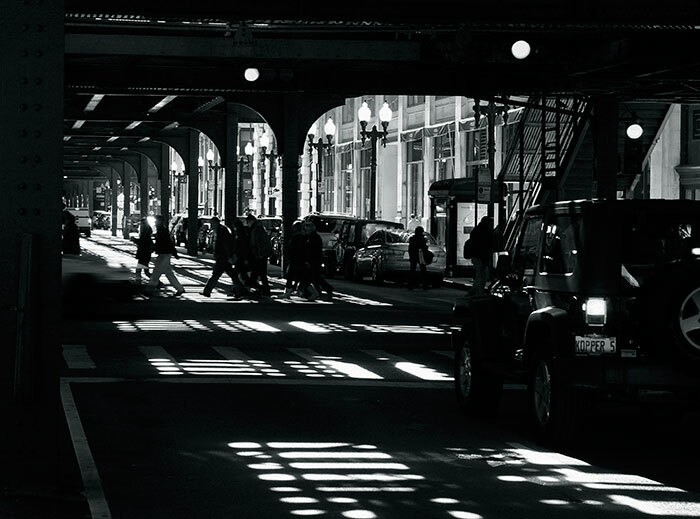 Looking south on Wabash Avenue, the dense patterns of light and shade created by the strong mid-day sun on the railway structure provided the primary interest. Walking underneath on this fine day provided some welcome shade but the sensation must be very different as rain or melting snow percolates through. 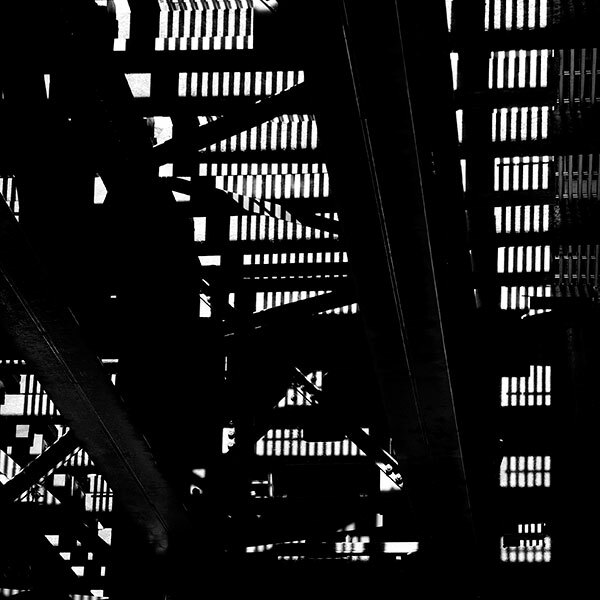 Under the railway I sought a flat abstract composition in whites set into a dense black.